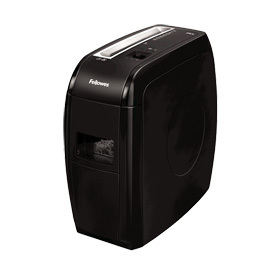 The Fellowes Powershred 21Cs Cross Cut Shredder is able to shred up to 12 sheets at a time into 4 x 52mm cross cut particles. Suitable for light, individual use, the shredder features a 15 litre bin and safety function, which automatically stops the motor when the bin is removed. The design also features a viewing window for easily monitoring levels of waste. The 21Cs will shred continuously for up to 5 minutes. The 21Cs also features Fellowes Safesense technology, which automatically stops shredding when hands touch the paper entry.